The perfect denim shirt ... does it exist? Should it exist? Dark or light denim? Can you wear double denim or is that a no no? I get asked these questions all the time along with if they're ok to wear still, what to wear with them and I have to say I struggle with knowing how to wear mine. That is until My Midlife Fashion started posting amazing outfits on Avenue 57. Yet again I am reminded why I set up the website last year. I can just steal these looks because I have the shirt (bought mine in Sainsbury's but they STILL don't have their clothes online so I can't link to it). So how do you wear your denim shirt? I just got this gorgeous jacket from Mango so I'm going to try and wear a slouchy grey tshirt underneath the denim shirt under the jacket - watch this space for a show and tell very soon! Fiona, go to the Zara Ireland website - I'm pretty sure the pearl necklace is still on there. 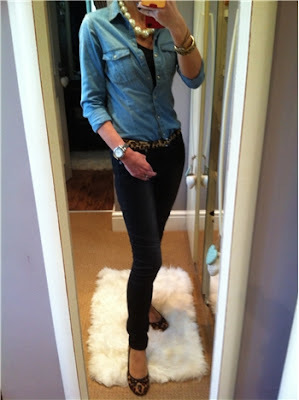 She looks amazing, but I am too butch for denim shirts, double denim? I would look like I was off to fell a tree or change a car tyre whilst lifting the car with one hand! LOL LOL I doubt you would look butch at all you daft bat! Double denim works if the denim is different in colour - that's my opinion anyway!!! Can't wait to see this Mango jacket in action now that you've finally got it. I hope it was worth it! It looks great on the hanger, shall try it tomorrow when I'm in the mood. Today I'm just slobbing about! when I got my first one a couple of years ago I felt VERY weird wearing it as the last one I wore was back in the 80s!! Wear, be proud and show me when you do!! think I had better check out mymidlifefashion she looks like my kinda gal! 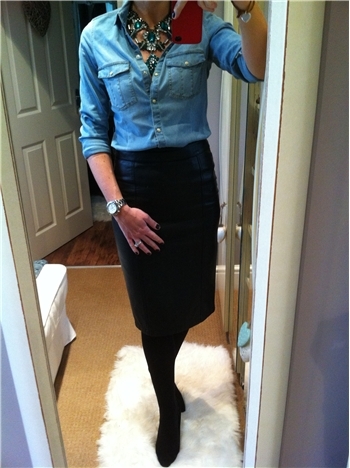 I'm obsessed with my denim shirt at the mo, it's on me again today. It's just so versatile, as denim goes with everything. I'm going to wear mine tomorrow! !